It has finally cooled off here– no more 100 degree heat. The mornings are a little chilly, and the afternoons are warm with a cool breeze. Amazing what that can do for your outlook. Perfect weather to make some art! 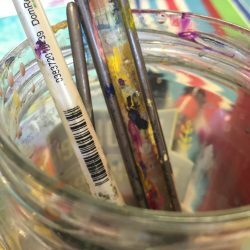 Within the past few weeks, I’ve completed about two dozen new works of art, from tiny 4 x 4″ works, to larger paintings and mixed media pieces. Some of them I started several months ago, and others I started and finished within a couple of days. I wanted to share a couple of the “before” and “after” pics with you. 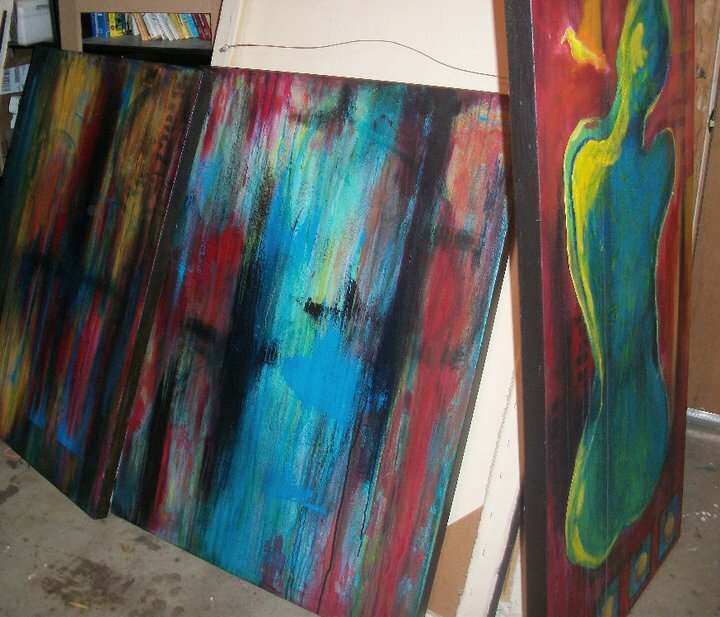 Here’s a photo of some ‘works-in-progress’ that I posted on my Facebook page back in July. I had been having fun layering paint, spraying the wet paint and watching it run. I didn’t really know where I was going with these paintings, but I like to work on top of a layered background anyway, so at least I had a starting point. 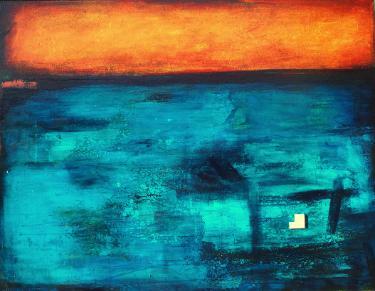 This painting, “Home” started out as the painting on the far left (above). As you can see, not much of the original underpainting is left, and the canvas was turned horizontally rather than vertically. The layered underpainting did help create a jumping off point. I started scraping layers of paint on top of it, and added layers of glazes for depth. 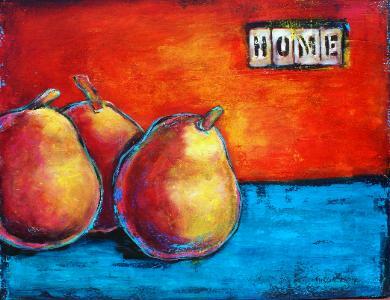 I was encouraged by my friend Robyn to do a larger version of ‘Home,’ as the first one was just 6 x 12.” So this canvas seemed to be a good fit.I changed up the colors a bit, but I’m really pleased with how it came out. As far as the third painting from the studio shot (the one with the figure in the top photo), it’s still a work in progress. I think I’ve almost worked it to death. We’ll see if it survives or gets reincarnated.